It sounds so beautiful on the outside. The silk-smooth crooning, honeyed harmonies, and lullaby acoustic guitars of "You Say You Love Me" can give the impression that it's a love ballad, a gentle whisper to a current flame. Rather, the new single from Messenger is actually the realization that the fire has been snuffed out; in fact, it was never there to begin with. "You Say You Love Me" is a tale of romantic deceit, when one's eyes are opened to the brutal reality of the situation. It's the kind of track that Marvin Gaye would've broken hearts with during his prime. Featuring vocalist Julio Hanson, guitarist Vic Butler, bassist Dino Stewart, keyboardist Bob Butler, and drummer/keyboardist John Moore, Messenger effortlessly weave together smooth jazz, R&B, and '80s soul music with the skill and passion of master craftsmen. 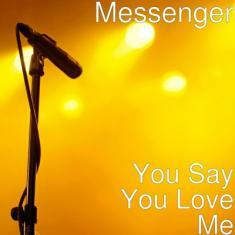 "You Say You Love Me" hurts so good, caressing the ears while evoking falling tears.